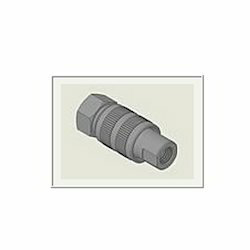 We hold proficiency in supplying and trading top quality array of Quick Disconnect Coupling in the industry. These quick disconnect couplings are highly efficient where fast connection and disconnection are required on the hydraulic system. Our quick disconnect couplings are able to provide unrestricted flow for safe and reliable functionality without premature flow. Moreover, these require low maintenance. Fluid temperature range -20 °C to +80 °C. Looking for Hydraulic Quick Release Couplings ?